You are one of two things. You are either a fighter or a flee-er. Your personality–the way God made you, coupled with your life experiences, and many other things–tends to lean towards one or the other. No matter which one you lean towards, however, nobody really enjoys conflict. Well, maybe some people, but they are the guys no one really wants to be around anyway. Conflict comes into our lives like storms. Storms come and they go. And so does conflict. We don’t really see either of them coming. Conflict, like a storm, just appears, and then we find ourselves in the midst of the metaphorical storm where we are faced with those two options: fight or flee. I don’t mean ‘fight,’ as in fist fight. I mean face it head on… in an appropriate way… in a healthy way. But that isn’t the purpose of this post. The purpose of this post is to remind us that there is great cost in being someone who runs–or flees– from conflict. You miss learning about yourself in new ways. You miss the opportunity to learn, period. You miss the opportunity for reconciliation. You miss the opportunity to display the gospel (us being reconciled to God because of Jesus). You miss the opportunity to teach your kids about the gospel. You miss the opportunity to teach your family about the gospel. You miss the opportunity to teach your co-workers about the gospel. You miss the opportunity to teach your church about the gospel. You miss the opportunity to not be me-centered and serve others. You miss getting to have a clear conscience when you take the Lord’s Supper (1 Cor 10:16-17). And I’m sure you miss much more… I just can’t think of anymore right now. 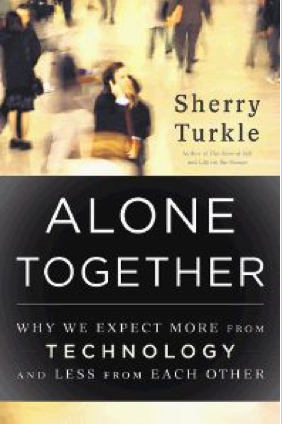 Sherry Turkle’s new book, Alone Together: Why We Expect More from Technology and Less from Each Other, has made waves in the technology and social media world as of late. The book is built on the recent truth that technology has now become the architect of our intimacies. With the rise of social media, we have an unlimited approach to being connected. With Twitter, Facebook, email, and text messaging, all in our front right trouser, we feel as if we are a part of something bigger than ourselves — this entire universe of unlimited relationships. However, here is the big kicker: We are more connect than ever before; yet, we are more lonely than ever before. Social media gives us access to anyone whenever we want them. Text messaging gives us the ease of conversation without the difficulty of a phone call. Unlimited access to email always makes us on call. With all of this, it seems as if we should never be lonely. But it is quite the opposite. Technology, and social media, in particular, has given us quite a distraction to what true and authentic relationships should actually look like. And we don’t even realize it. PROPHET, PRIEST, and KING — What Type of Leader Are You? In the Old Testament, there were 3 primary offices — Prophets, Priests, and Kings. Jesus fulfills all three of those offices in the New Testament and is still fulfilling those offices today as he reigns from God, the Father’s, right hand. Today, the church needs all three types of leaders. It needs both prophet, priest, and king-type leaders. Building from my post a few days ago about how technology is destroying personal relationships, I want to explore the concept of having a media sabbath. A sabbath is generally a day of rest observed for specific reasons. A biblical sabbath is a day of rest in observance of the 7th day of the week. Not to be confused with Sunday, which is often observed as the biblical sabbath, Saturday is the last day of the week. In Genesis 1, God set aside the 7th day, calling it holy. In Exodus 20, God gives Moses the 10 Commandments, in which the observance of the sabbath is commanded. Today, the concept of having or observing a sabbath is seldom. I do, however, know many people in the South who observe the sabbath on Sunday. They say things like, “I don’t mow my yard on Sunday because it’s the sabbath.” Now that is a fine thing to say and do if you are observing the sabbath but what about taking a break from something we spend the majority of our time doing… or the majority of our time using… something like technology and media. We need to unplug from time to time. I need to unplug from time to time. I have heard that Rob Bell takes personal media sabbaths every Friday. I have also heard that Beth Moore takes personal media sabbaths every day that she teaches at a conference or event. I have tried to start having media sabbaths in my life but it is easier said than done. Because even when you take a personal media sabbath, those who want your attention still want your attention. Emails still pile up. People still call you. People still send you text messages. I need to figure out something that works for my schedule. I would love to hear how you take media sabbaths. Help a brother out! This is worth all 8 minutes. Better grab a Kleenex box… or two. That was tweeted today by Pastor JR Vassar from Apostles Church in New York City. If the Church isn’t the primary adopting community fully embracing the orphan, we will forfeit that privilege to the gay community. One of the commands that Scripture gives us is to care for the orphan and the widow in their affliction (Jas 1:27). When we do this, we reflect God’s character to the world. What’s more, the gospel of Jesus Christ means that Christians should be at the forefront of the adoption of orphans close to home and around the world. When we are not doing this, then we will forfeit that privilege to the gay community. We ought to be reminded that Jesus is not born into a gauzy, snowy winter wonderland of sweetly-singing angels and cute reindeer nuzzling one another at the side of his manger. He is born into a war zone. And at the very rumor of his coming, Herod — the Planned Parenthood of his day — vows to see him dead, right along with thousands of his brothers (63). For Christians, this is not charity. This is not a social program aimed at simply helping those who are powerless. This is spiritual warfare. And coupled within it is a call to care for children, both in the womb and the orphan outside of it. Here is my question though: Will the gay community care for the un-adoptable? Will the gay community adopt the child with HIV/AIDS? Will the gay community adopt a down syndrome child? Will the gay community adopt a child with a cleft palate? Here is the difference: Adoption is distinctively a Christian action. It is based on character and mandate. This is still distinctively Christian in a world that increasingly sees children as, at best, a commodity to be controlled and, at worst, a nuisance to be contained. Think of how revolutionary it is for Christians to adopt a young boy with a cleft palate from a region of India where most people see him as “defective.” Think of how counterintuitive it is for Christians to adopt a Chinese girl — when many there see her as a disappointment. Think of how odd it must seem to American secularists to see Christians adopting a baby whose body trembles with an addiction to the cocaine her motor sent through her bloodstream before birth. Think of the kind of credibility such action lends to the proclamation of our gospel (79). If the church forfeits adoption to the gay community, then will these children be adopted? Who will adopt the un-wantable, the outcast, the sick — if it isn’t for the church? Please! Please church! Please rise up to this task. Not everyone is called to adopt, but everyone is called to care for the orphan. Not every believer will stand praying outside an abortion clinic. Not every believer will take a pregnant teenager into his or her guest bedroom. Not every believer is called to adopt children. But every believer is called to recognize Jesus in the face of his little brothers and sisters when he decides to show up in their lives, even if it interrupts everything else (81). This coming Saturday morning, September 1st, Foothills Church will be praying for our city. I want to encourage you to come out and be a part of this. In the New Testament, the church is literally called, “the sent ones.” We want to practice this every week as we gather on Sundays to be exhorted through preaching and to worship through song and giving. What’s more, we gather throughout the week in homes with one another for fellowship and continued relational discipleship attempting to reflect Acts 4 to the best of our ability. We gather together and then go out into the world to be the hands and feet of Jesus. We gather together. Then out we go. I hope there is a great turnout this coming Saturday morning for Prayer for the City. What’s more, this will be a great way to serve as a family and model to your children how to pray for your community. We gather together. Then our we go… as a family… children and all. In the meantime, here is the email our pastoral staff sent. You can register here. Prayer for the city is this Saturday, September 1st, from 8:00am to 9:00am. In cooperation with the “Generations” series we want to seek God’s will together as a church and pray for a spiritual awakening in our city. We will meet at FC at 8:00am to get instructions and a prayer guide. Then we will direct you to a strategic location in our city where you will be able to pray for the specific needs of that location. Join your pastors this Saturday morning as we saturate our city in prayer. The Verge Network continuously puts out good stuff on being missional. I know some people hark on the word “missional” but I don’t know a better way to describe a bible-believing-first-world–21st-century-type-of-Christian. So, for me, I use this word, and I want my church to use this word as part of their daily vocabulary, as well. In the normal rhythms of life pursuing to meet and engage new people. Prayerfully watching and listening to the Holy Spirit to discern where God is working. Looking to boldly, humbly, and contextually proclaim the gospel in word and deed. Walk your dog regularly around the same time in your neighborhood. Sit on the front porch while letting kids play in the front yard. Invite neighbors over for dinner. Attend and participate in HOA functions. Attend the parties invited to by neighbors. Do a food drive and coat drive in winter and get neighbors involved. Have a game night (yard games outside or board games inside). Art swap night — bring out what you’re tired of and trade with neighbors. Grow a garden and give extra produce to neighbors. Have an Easter egg hunt on your block and invite neighbors. Start a weekly open meal night in your home. Do a summer BBQ every Friday night and invite others contribute. Create a block/street email and phone contact list for safety. Host a sports game watching party. Host a coffee and dessert night. Organize and host a ladies artistic creation night. Organize a tasting tour on your street. Host a movie night and discussion afterwards. Start a walking/running group in the neighborhood. Start hosting a play date weekly for other stay at home parents. Organize a carpool for your neighborhood to help save gas. Volunteer to coach a local little league sports team. Have a front yard ice cream party in the summer. If you would like to subscribe to this blog via e-mail, then fill-in your e-mail address below. Subscribers will receive an e-mail whenever new content appears.